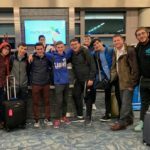 On November 12th – 15th, MTA partnered with New Jersey NCSY and NECHAMA Jewish Response To Disaster for a chessed mission to South Carolina. Ten talmidim from the Sophomore and Junior Grades joined the mission, along with Director of Teaching and Learning Rabbi Dov Emerson. Thinking about doing chessed is one thing. Hopping on a plane and flying to a different state to spend two straight days gutting an entire house to prepare it for being rebuilt is an entirely different experience. We worked alongside the homeowner, tearing apart walls and removing debris, while the homeowner shared her story with us. She described the flooding and the devastation her community endured and told us that she literally had no idea how she was going to get all the work done herself and how grateful she was that complete strangers flew all the way to her town to help her. It reminded me that there are people across the world whose entire lives have been ruined and essentially have nothing and no one to turn to, but we as Jews, always have Hashem and the strength of our Jewish community to support us. It’s our responsibility to pay it forward and make a positive impact on the lives of others.